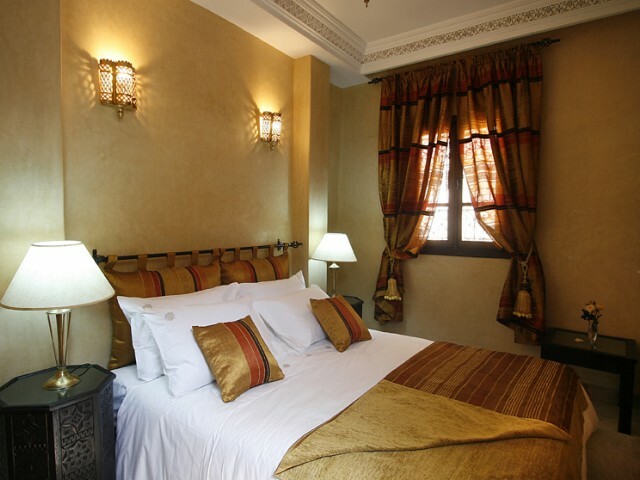 This splendid entirely renovated Riad, typically Moroccan with all the keys of modernity necessary, is just beside the famous place Jemaa el Fna in the heart of the old Ksour area and also near the famous souks. The house has 17 rooms carrying all of the invaluable stone names. These small jewels are a tasty panel of the multiple colors and styles of contemporary Moroccan decoration and all can accomodate up to 36 people. 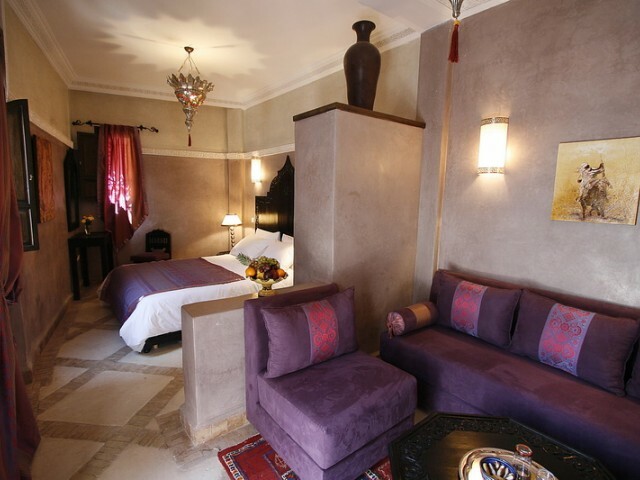 The kitchen is prepared by a Moroccan chief who will make you discover the finest food of the country. Since 2010, Al Rimal June also has L ' name of the environmental label €the Green Key€. Sapphire or Beautiful beyond BlueVast suite on the ground floor, viewing on the fountain, calm and fresh. White tadelakt walls and beautiful major blue fabrics. 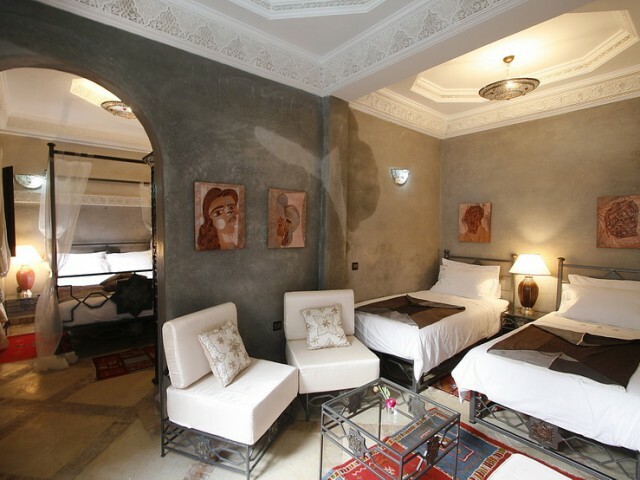 Splendid engraved plaster ceilings.Equipped with 2 beds 90 X 200, twins or double to choose. Very beautiful bed head out of maillechort. Dressing table with mirror.Living room with large seat in tadelakt and cushions.Bathroom with shower all in tadelakt blue, maillechort wash-hand basin and WC,.Hair dryer. Reversible air-conditioning. Safe. Vast suite on the ground floor, viewing on the fountain, calm and fresh. 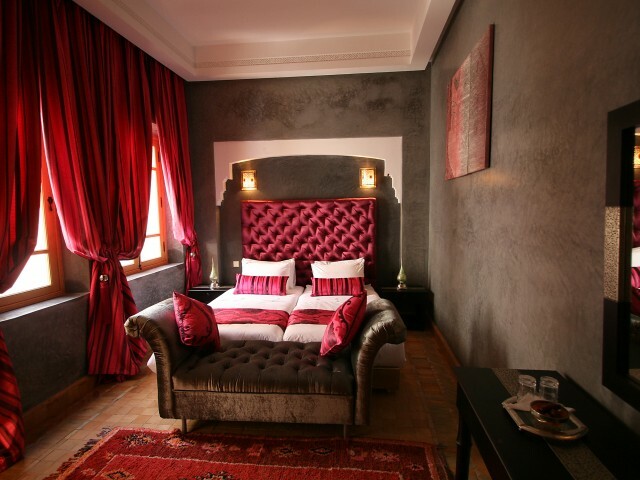 White tadelakt walls warmed up with sumptuous red and ancient silks under superb engraved plaster.Equipped with 1 double bed 160 x 190. 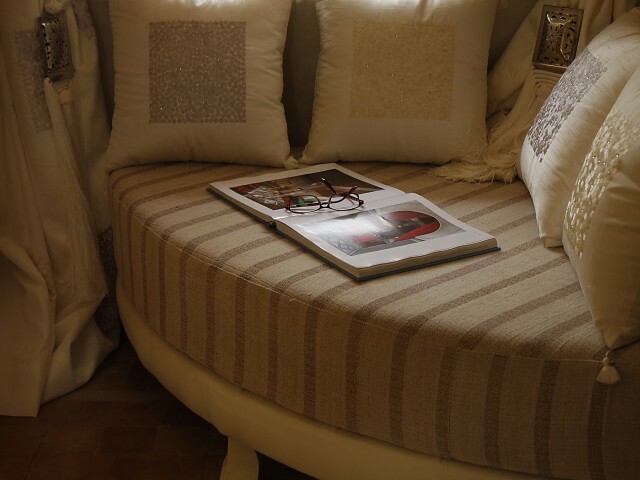 Very beautiful bed out of cedar wood featuring a typical Berber design. 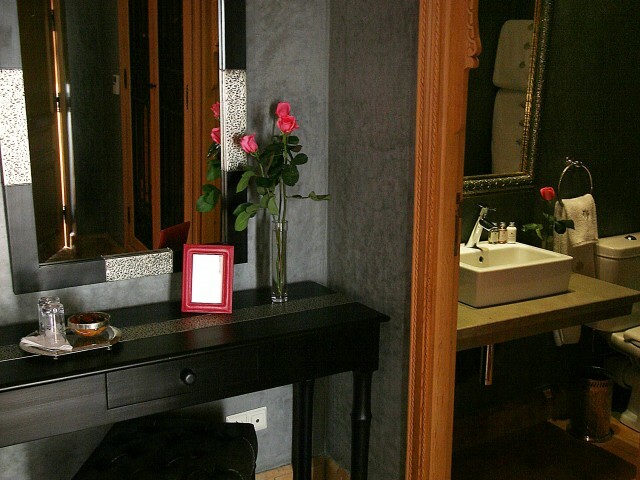 Dressing table with mirror.Living room with large seat in tadelakt and cushions.Bathroom with bath-tub all in tadelakt red. Copper wash-hand basin and WC, Hair dryer. Reversible air-conditioning. Safe. Emerald, Green of the Life and the Light Vast suite on the ground floor, viewing on the fountain, calm and fresh. 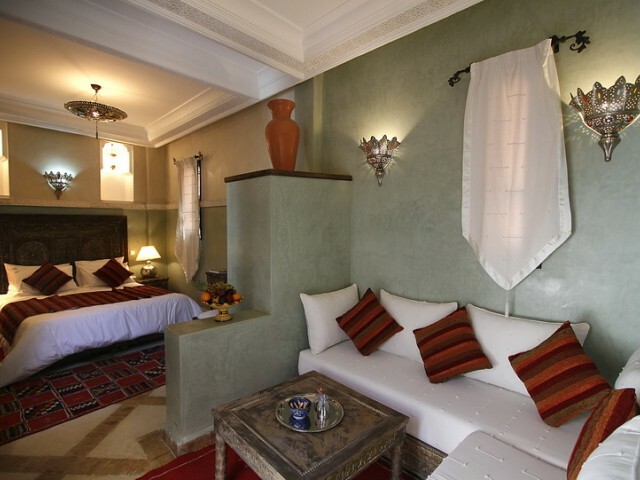 White tadelakt walls decorated with Moroccan fabrics, in a merry harmony of greens! Superb coffered plaster ceilings Equipped with 2 beds 90 X 200, twins or double to choose. Very beautiful bed head out of patinated copper. Wall cupboard with rack and closet. Dressing table with mirror.Living room with large seat in tadelakt and cushions.Bathroom with shower all in tadelakt green, maillechort wash-hand basin and WC.Hair dryer. Reversible air-conditioning. Safe. 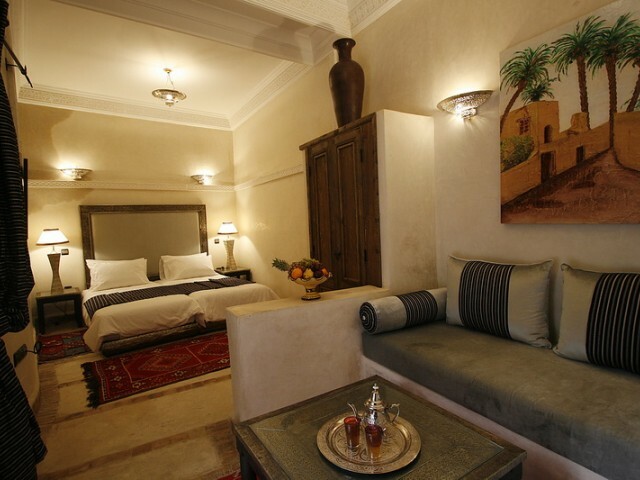 Vast suite on the 1st floor, with sight on the fountain, being able to accommodate very comfortably 4 people. 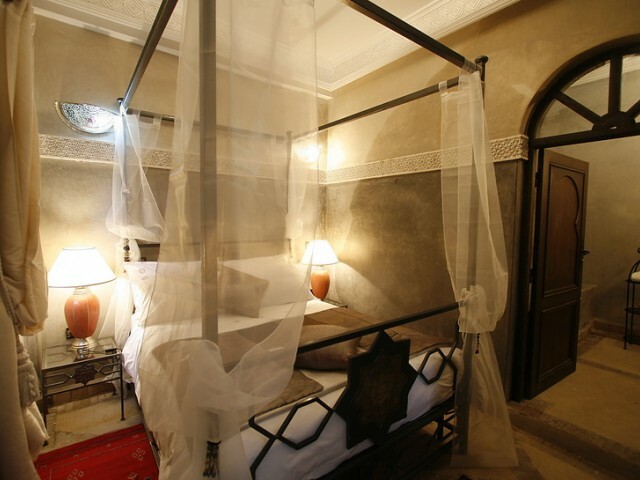 Splendid walls of gray tadelakt, decorated with admirable planks and ceilings of carved plaster.Four-poster bed out of wrought iron, 140 X 190 on the one hand, and 2 beds 90 X 200, joined or separated. 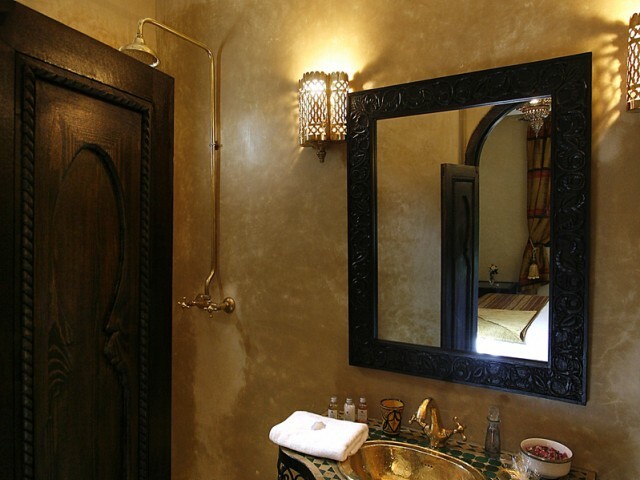 Dressing table with mirror.Living room with ancient Moroccan seatsBathroom with bath-tub all in tadelakt grey, maillechort wash-hand basin and WC,.Hair dryer. Reversible air-conditioning. Safe. Vast suite on the 1st floor, viewing on the fountain, luminous and merry; White and green tadelakt walls lighted up with thick white cotton fabrics. 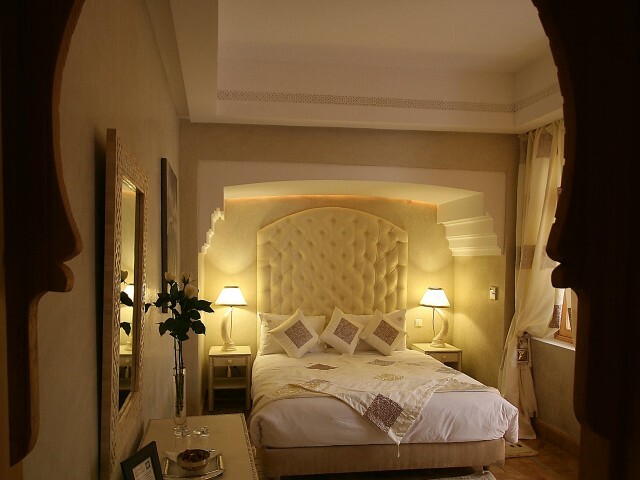 Very beautiful ceilings and niches carved by our craftsmen plasterers.Equipped with 1 double bed 160 X 200. Splendid bed head created starting from a diverted ancient door of its use. Wall cupboard with rack and closet. Dressing table with mirror.Living room with large seats in cedar wood.Bathroom with shower all in tadelakt green, maillechort wash-hand basin and WC.Hair dryer. Reversible air-conditioning. Safe.Accommodation for 2 people. Possibility of adding a small bed for a baby. Suite on the 1st floor, with sight on the fountain, luminous and resting. 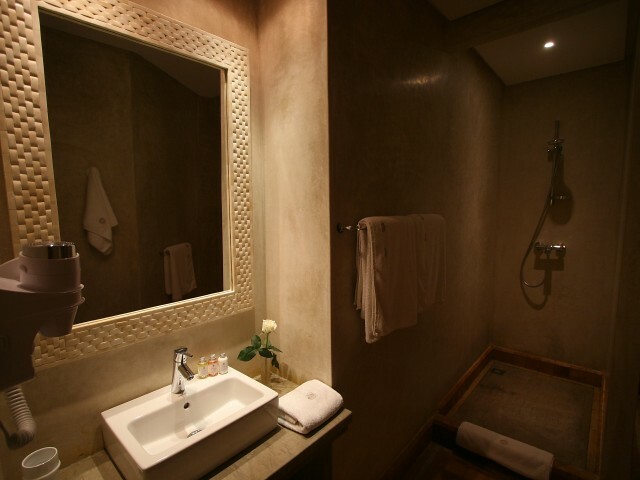 Walls of tadelakt Parma and white, decorated with sumptuous plaster planks and ceilings. Shimmer velvet and satin fabrics declining the tones from pink to mauve, through purple.Large bed 160 X 200 out of wood of cedar with Moroccan typical design. Wall cupboard with rack and closet. Table with mirror.Living room with seats in cedar wood.Bathroom with bath-tub all in tadelakt amethyst, maillechort wash-hand basin and WC.Hair dryer. Reversible air-conditioning. Safe. 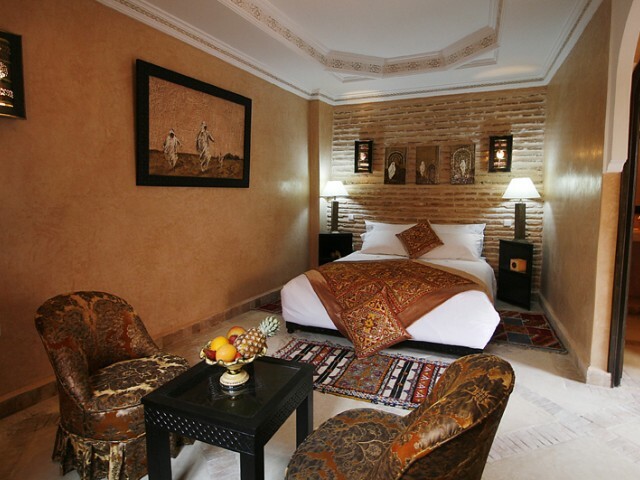 Large suite on the 1st floor, with sight on the fountain, decorated in pure white and silver.Walls of tadelakt, with sumptuous plaster planks and ceilings. Large bed 160 X 200 out of noble wood with silver plated incrustations. Dressing table with mirror. 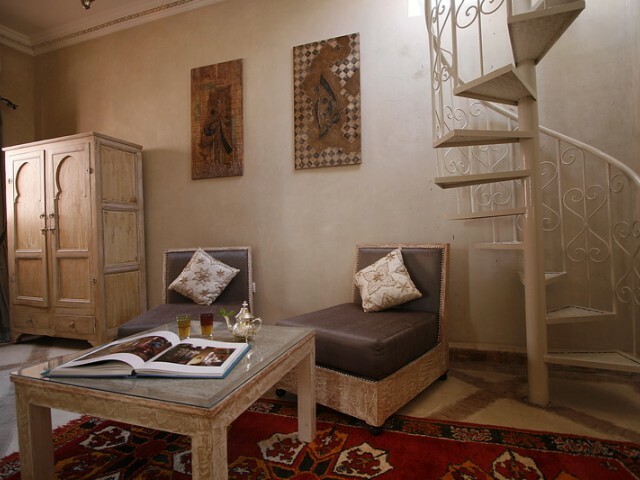 Private terrace accessible through an interior spiral staircase, with zelliges table and deck chairs, with the shelter of the glances.Living room with ancient Moroccan seats. TV satellite. 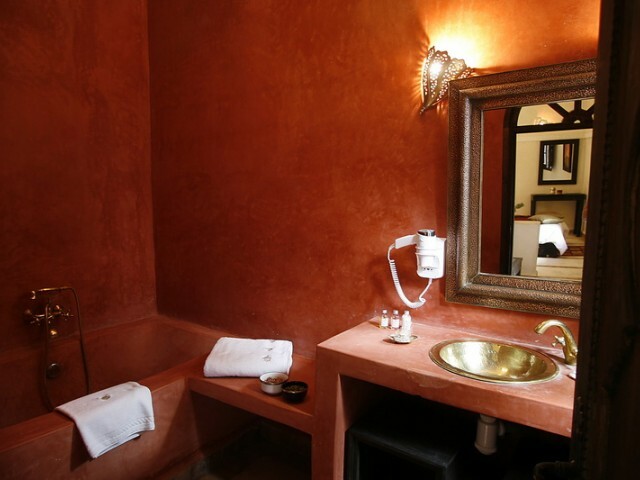 Safe.Bathroom with bath-tub in tadelakt white, maillechort wash-hand basin and WC.Hair dryer. Reversible air-conditioning. 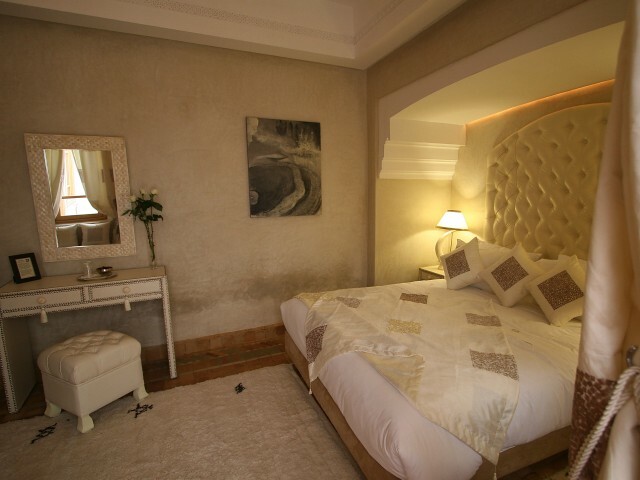 Bedroom located at the 1st floor, viewing on the swimming pool, luminous and beautiful. 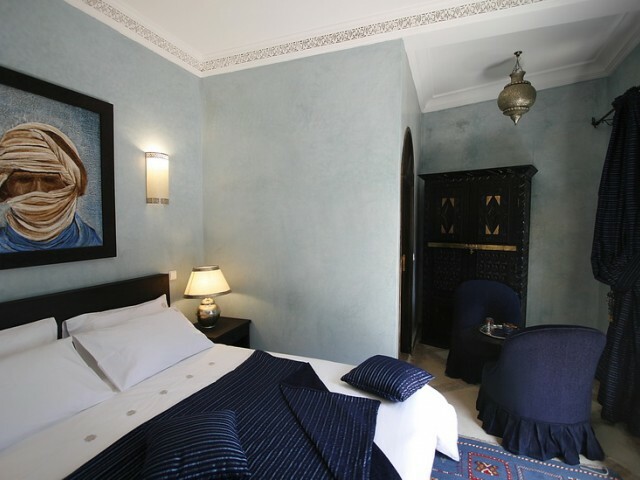 The blue and white tadelakt walls are decorated with navy blue curtains. 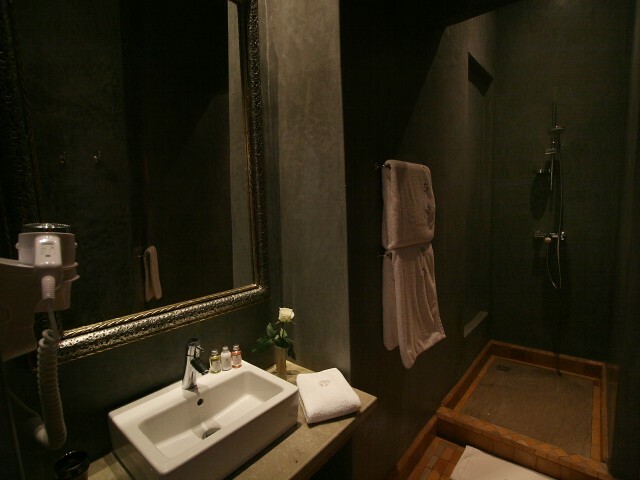 Large Bed (160 X 200) in dark wood with silver plated incrustations.The small living room displays 2 armchairs.Bathroom with shower all in tadelakt blue, maillechort wash-hand basin and WC.Hair dryer. Reversible air-conditioning. Safe. 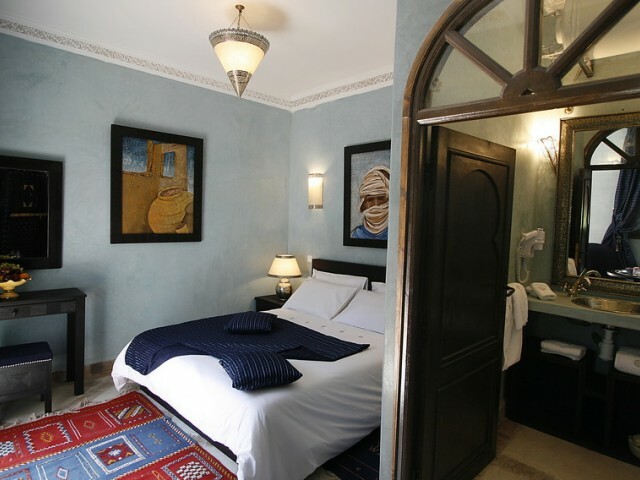 Bedroom located on the 1st floor, viewing on the swimming pool. 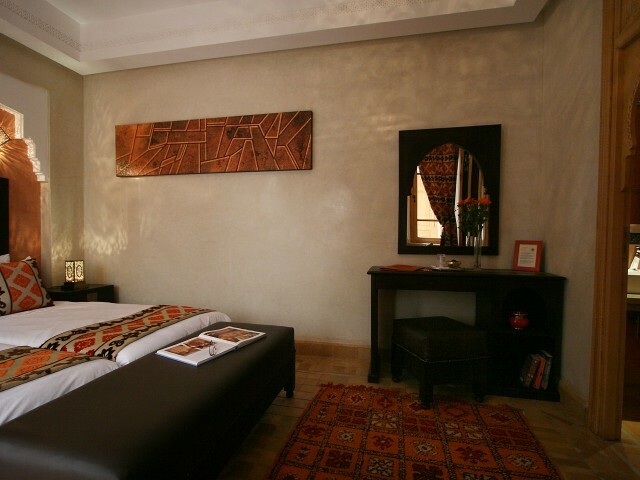 The beige tadelakt walls are warmed up by brown and sand fabrics in a geometric design.The bed (140 X 190) has a beautiful bed head in brown tadelakt, decorated with an ancient piece of patinated copper. 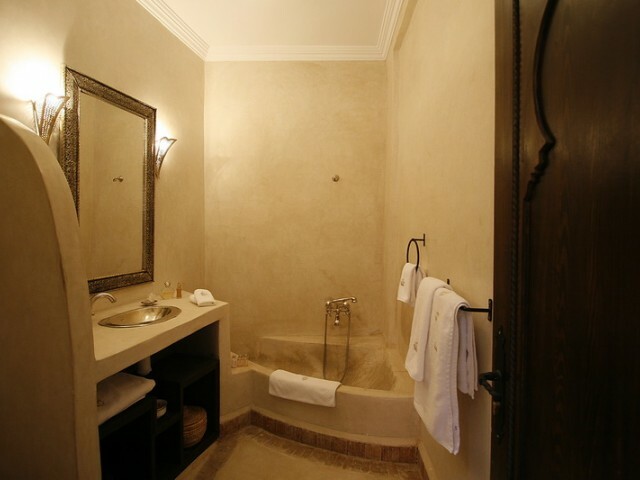 Bathroom with shower all in tadelakt beige, with a cute wash-hand basin and WC,.Hair dryer. Reversible air-conditioning. Safe. 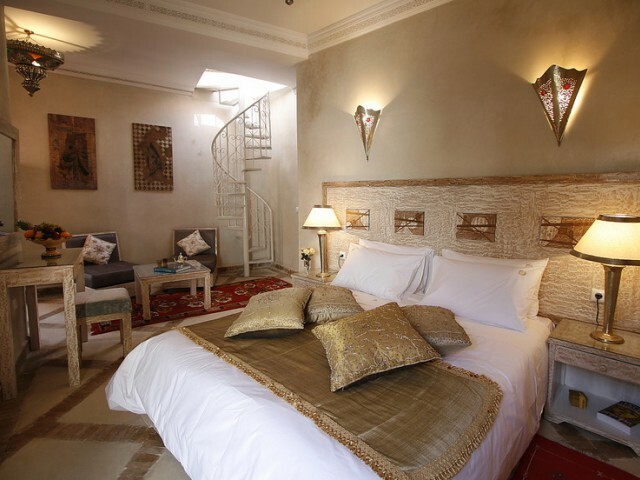 Beautiful bedroom on the 1st floor, viewing on the swimming pool, sunny and bright. 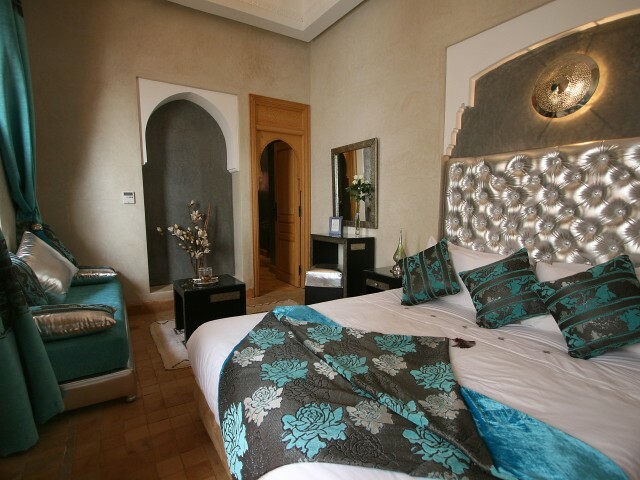 White and blue tadelakt walls, decorated with superb and sparkling turquoise curtains. Double bed (140 X 190). Cupboard with rack and closet.Bathroom with shower all in tadelakt blue, with a maillechort wash-hand basin and WC,.Hair dryer. Reversible air-conditioning. Safe. 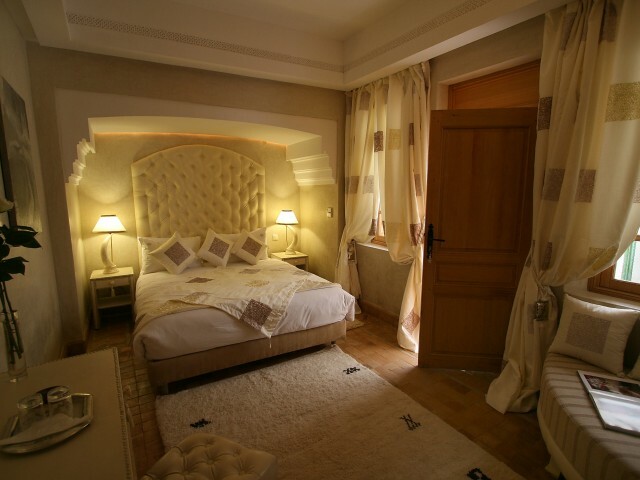 A very nice bedroom on the 1st floor, viewing on the swimming pool. 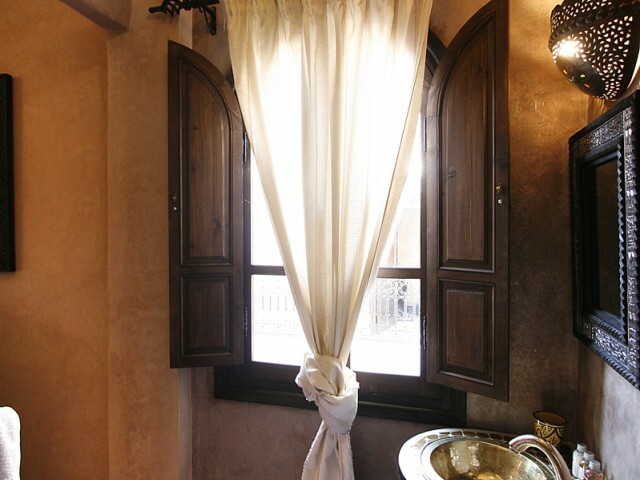 The walls have a sunny yellow shade, decorated with warm yellow curtains. Large bed (140 X 190). Cupboard with rack and closet.Bathroom with shower all in tadelakt yellow, with a copper wash-hand basin and WC.Hair dryer. Reversible air-conditioning. Safe. 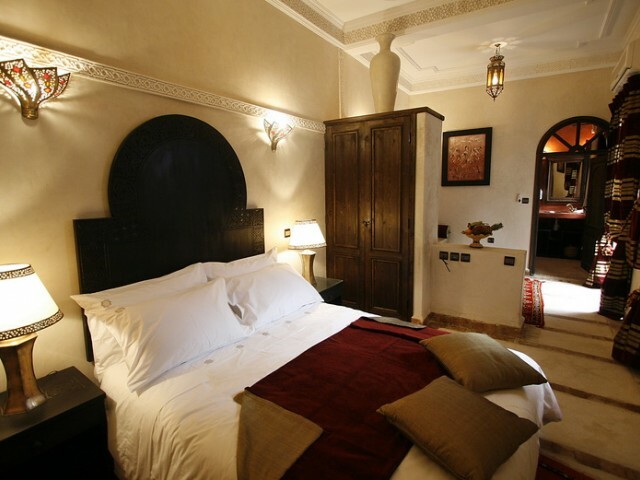 Large suite on the 1st floor with sight on the swimming pool, cordial and authentic. 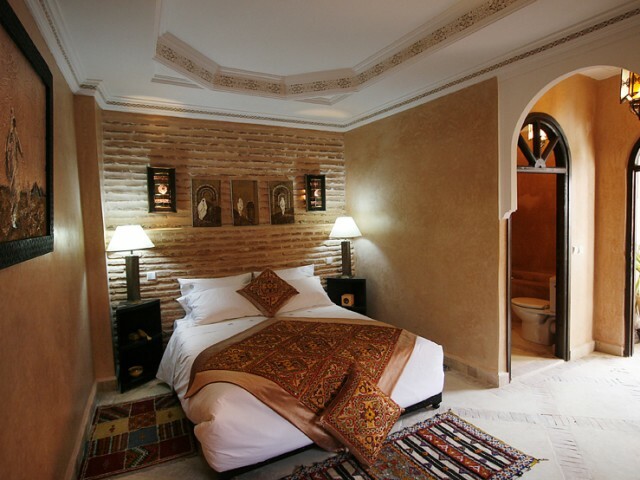 Walls of tadelakt and restored ancient brick, decorated with splendid ceilings. Colored velvet fabrics richly decorated with sequins, in pink coral tone Large bed 160 X 200 out of wood of cedar with silver plated incrustations. Wall cupboard with rack and closet. 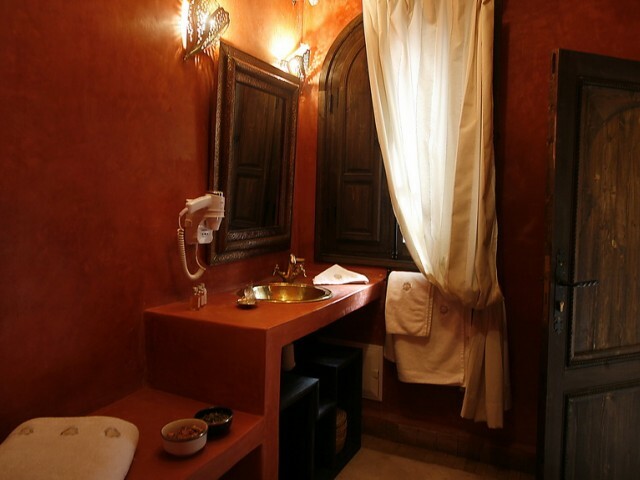 Table with mirror.Living room fitted with ancient Moroccan seatsBathroom with shower all in tadelakt coral, copper wash-hand basin and WC.Hair dryer. Reversible air-conditioning. Safe. "Nous avons passé une super semaine dans le riad, meublé avec goût et entouré d'un personnel attentionné. Nous avons profité de l'excellente cuisine proposée. 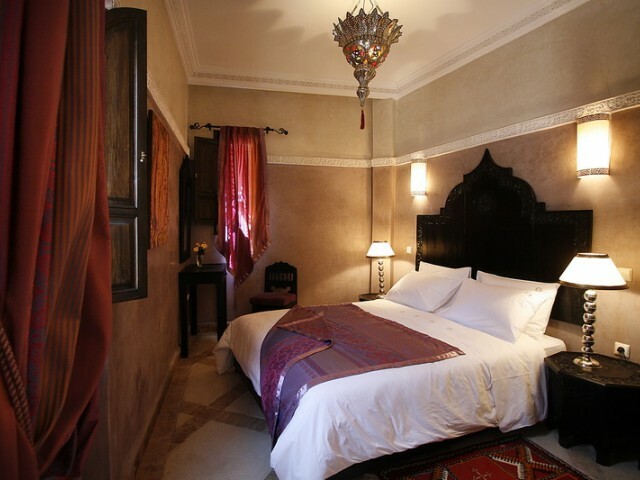 Un super séjour pour nous qui d&e"
After your breakfast served under the first rising sun, you will sunbathe and use the jacuzzi before exploring the shady alleys of the Medina. Either for a cardio-training session or just to take advantage of your time to improve your good shape during your stay, you will find everything to satisfy your wishes. This space will welcome you around a drink, back from the souk, before or after dinner, and will allow you to relax with your friends in a cozy atmosphere. You will find there a plasma screen to view you favorite sport or just keep in touch with world news. Under the overwhelming heat of the summer, you will appreciate to relax in the pool. For some strokes or just for fun, the crystal clear water will contribute to the expected relaxation. Heated in winter, you will be able to go for a swim all around the year. Either to explore the city or its surroundings, the Lalla Takerkoust lake, the Ourika valley, the Atlas mountains, or for a full day, skiing at Ouka?meden or walking in Essaouira, or even several days in the desert, we will introduce you to the best guides of the country. Our cook is a supporter of creative tastes. He plays with subtleties of the Moroccan gastronomy and uses the numerous spices found in the souk, married to the seasonal fresh products, bought on the market.You will choose to taste these delights in the Moroccan dining room or on the terrace. Evening menu around 20/25 ?. On request. 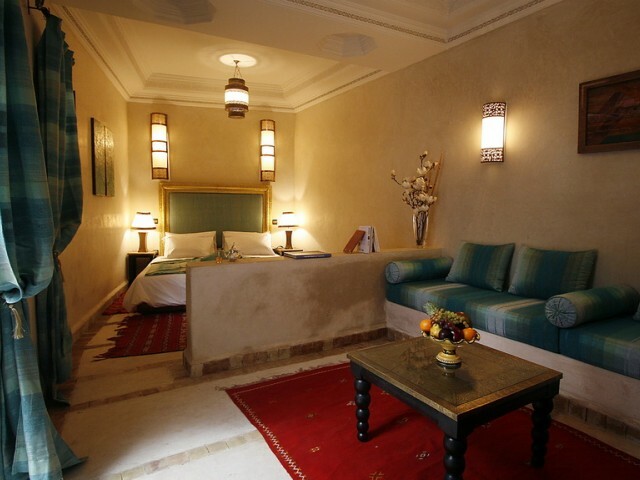 Rate 250 dirhams for 2 people, round trip. Chemel 42, le 09 janvier 2014 "Super séjour"
"Nous avons passé une super semaine dans le riad, meublé avec goût et entouré d'un personnel attentionné. Nous avons profité de l'excellente cuisine proposée. Un super séjour pour nous qui découvrions Marrakech. daniel, le 08 janvier 2014 "superbe"
Zaz, le 19 novembre 2012 "Que du bonheur !" "Arrives en groupe pour feter l'Anniversaire d'une amie tres proche, touta ete mis en oeuvre par le proprietaire et le personnel pour que notre sejour soit inoubliable, convivial et chaleureux. Ce sejour restera marque dans nos memoires ! Accueil excellent, emplacement ideal dans la Medina, suffisement de chambres pour reunir un groupe d'amis dans un superbe espace, beaucoup de charme. Fifi, le 03 novembre 2012 "Séjour des 27 et 28 octobre"
"Séjour agréable avec Foued et son équipe à l'écoute des clients dont la gentilesse et la disponibilité sont de vrais atouts. A 2 pas de la place Jemma-el-Fna et des souks. Hans, le 20 juillet 2012 "Magique !!" "POUR NOTRE VOYAGE DE NOCES NOUS NE POUVIONS REVER MIEUX.C'EST LE RIAD A MARRAKECH OU IL FAUT ALLER SI VOUS VOULEZ ETRE DANS LE COEUR DANS MARRAKECH TOUT EN CONSERVANT UN CONFORT EXCEPTIONNEL. cc07, le 13 avril 2012 "sejour reussi"
"Tres bon emplacement tout pres de la place, total depaysement,tres bel amenagement interieur,gentillesse du personnel......un excellent sejour en famille avec deux ados,une adresse à conseiller. sorciere_bloc, le 31 janvier 2012 "le paradis"
éprochable,un personnel aux petits soins, et une masseuse vraiment très "PRO" à qui je dois beaucoup après la course! 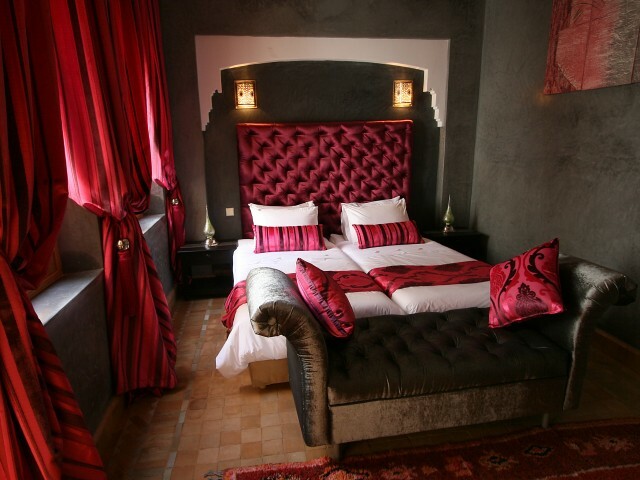 !Une maison incontournable à marrakech, mais laissez nous encore de la place pour notre prochaine visite!!!" Merci beaucoup pour votre message qui nous va droit au coeur ! theartist, le 25 janvier 2012 "conforme en tous points"
reel enchantement. Une dérniere chose , n'hesiter pas a profiter du massage prodigé par une vraie pro (rapport qualité prix imbatable) Encore merci a toute l'équipe.Imede&Djam"
ormeau, le 09 d�cembre 2011 "FONCEZ.....SANS MODERATION !!!!! !Excellent"
s NOMBREUX riads de cette ville...Bilan : NOUS AVONS ADORES!Une lieu de rêve : Au pied de la Médina, une minute à pied de la place Djemma El Fna mais pas de souci par rapport au bruit, c'est d'un calme absolue. Une décoration des plus soignée, effectuée avec beaucoup de goût dans l'esprit marocain. C'est presque mieux en vrai que sur le portail internet....Un accueil chaleureux et un service irréprochable : Nous sommes arrivés en début de nuit le chauffeur de l'hôtel nous attendait à l'aéroport. A la descente de voiture, quel dépaysement !!! il va crescendo (du moyen âge bruyant de la rue à la volupté de l'hôtel) jusqu'à la porte du Riad al Rimal où les propriétaires nous ont accueilli très chaleureusement....Les propriétaires (Christian et Marie Annick) sont discrets, charmants, et très disponibles pour répondre à nos questions. Le personnel, très attentif, saura vous renseigner sur les endroits à visiter, les excursions, les soins etc...tout est parfait! J'ai fait plusieurs fois le hammam et le massage, l'endroit y est très propre, reposant et la masseuse très professionnelle (ce qui n'est pas toujours le cas à Marrakech). Concernant les chambres (perle et corail) très raffinées, la décoration du dessus de lit change tous les jours. Le petit déjeuner voluptueux: Sur la terrasse au calme, sous le soleil, un régal avec ses crêpes marocaines et pains « maison », ses fruits, confitures, miel et du beurre salé (et oui comme en Bretagne!!!) Une excellente entrée en matière avant d'attaquer les souks et visites des beautés de la ville Le dîner raffiné: Le maître des lieux Saïd, est un excellent cuisinier. Cuisine excellente et raffinée. Difficile de trouver un meilleur rapport qualité/prix dans la ville......... Je ne peux que vous conseiller ce bel endroit charmant, envoutant... foncez! Forcément nous y retournerons bientôt ?..... " Karine, le 14 novembre 2011 "Une parenthèse enchantée"
ner puis nous allions nous promener. Retour au calme, soit dans notre chambre superbe, soit dans un des salons ou sur la belle terrasse, en n'oubliant pas un arrêt au hammam! Seul le jacuzzi était trop froid pour nous! Nous y avons dîné aussi 2 soirs, repas excellent en compagnie de nos hôtes. Mon mari recommande le cours de cuisine orientale. Il y a passé 3 heures fantastiques à cuisiner sous les conseils avisés du très, très sympathique chef.Merci encore Marie-Annick, Christian, Ismaël et tous les autres..."
famille 59, le 30 ao�t 2011 "séjour d'exception"
u'attendent leurs clients. Le personnel est parfait et très à l'écoute.Les repas servis sont d'une exceptionnelle fraîcheur Très beau souvenir"
cmf971, le 22 ao�t 2011 "Très beau Riad calme et accueillant"
accueillante. Nous avons pu demander des conseils au propriétaire qui était là chaque jour. Le personnel est aussi très disponible, on s'est vraiment sentis bien. évidemment, les touristes ayant déserté Marrakech cet été, l'endroit était un peu vide et triste, mais c'était pareil partout." Un directeur et son personnel très disponible et sympathique, des chambres bien équipées. val�rie, le 11 mai 2011 "charme, repos, confort"
"très agréable, personnel et propriétaire très disponibles, charmant et discrets aussi. Nous y sommes restés la semaine avec les enfants, en chambre séparées, c'était parfait, comme une maison de vacances mais sans s'occuper de rien! Fabrice VARENNE, le 05 mai 2011 "Parfait !" ;jour, et Christian a bien apprécié nos blagues de méridionaux !.L'emplacement du Riad à 100 m du centre de Marrakech vous facilite les déplacements.Les conseils d'excursions, les tarifs négociés par Marie Annick, les repas du soir sur la terrasse dans un cadre super agréable, les chambres (premier prix très raisonnable) avec un décor soigné, et pour finir le personnel d'une gentillesse vraiment agréable et sincère, ça change de certains hôtels qui ressemblent à des halls de gare !! !Bref, nous avons été conquis pour notre premier en riad (et certainement pas le dernier ! )Familles BRIVOAL et VARENNE "
Laure, le 05 mai 2011 "Riad Al Rimal"
e des traditions (cuisine -table excellente-, massages ...)et convivialité ! L'ensemble du personnel est à l'image des hôtes, Maris-Annick et Christian, efficace, discret, chaleureux et souriants.Un endroit à découvrir ...pour y revenir..!" patfab, le 06 avril 2011 "super Riad"
fabluc, le 02 ao�t 2010 "Celui là OUI !" Une porte un peu basse ! ! ! Patrice Fortier, le 14 juin 2010 "Marrakech toujours plus acceuillant"
t vaste pour ne jamais souffrir de promiscuité avec les autres occupants, par ailleurs l'aménagement de nombreux petits salons facilite également cette sérénité durant le séjour." pat_1300, le 13 mai 2010 "A conseiller !" 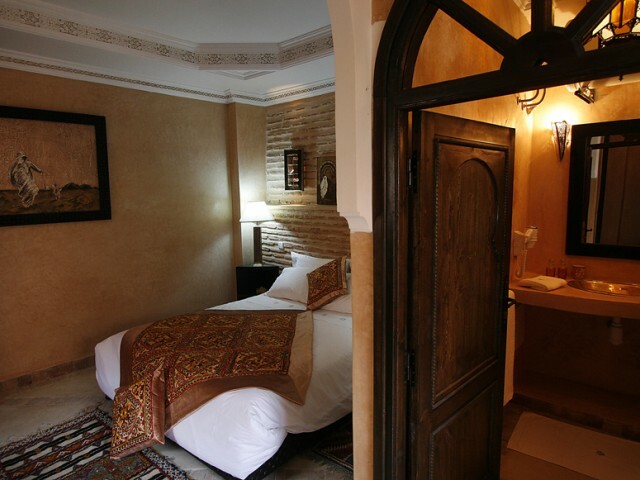 tyle différent, sont exactement comme sur les photos du site web de l'hôtel.Accueil très chaleureux par les propriétaires, des Francais qui sont tombés amoureux de Marrakech et veulent transmettre leur passion à leurs hôtes... pour qu'ils se sentent dans un palais des mille et une nuit.Equipement très complet pour un riad: hammam ( gratuit! ), petite piscine, climatisation dans les chambres, salle sport, Wifi gratuit.Superbe terrasse sur les toits, pour les repas ou profiter du soleil." Natacha, le 25 mars 2010 "Un séjour inoubliable"
"Un magnifique endroit où tout n'est que calme, dépaysement et bien être. N'hésitez pas à faire une visite au hamam privé. hugues, le 17 mars 2010 "10/10"
"Un accueil chaleureux , un riad trés bien tenu et agréable. Une cuisine délicieuse. anon, le 10 mars 2010 "Parfait pour un séjour en famille;"
es.J'aimais bien le bruit de la fontaine.La terrasse était très agréable avec ses matelas sous une bâche.Lola, 9ans." Emplacement,confort, charme, tranquillité, équipements, disponibilité et gentillesse des propriétaires et du personnel. prix un peu élevé du repas du soir. Chantal, le 03 mars 2010 "séjour irréprochable et accueil chaleureux"
egrave;s sympatique d'un couple qui venait voir également l'arrivée à Marrakech de leur fils participant au4L Trophy .Personnel très serviable et discret.Notre séjour fut trop bref...C'est une maison d'hôtes où l'on se sent bien et où on peut prendre le temps de discuter avec les autres résidents.Vous serez conquis. Nous le renseignons chaleureusement." Dordogne, le 24 f�vrier 2010 "un petit coin de Bonheur"
a. Décoré avec soin un service sans reproche, nous conseillons le hammam et le massage détente assurée. Jocelyne et Dominique de Dordogne "
salfana, le 15 f�vrier 2010 "havre de paix"
nnée (inquiet) Samuel a ouvert et un grand sourire nous a dis ahhhhhh enfin votre voyage a ete dur ect... nous a fait asseoir et tout en discutant avons pris le the avec des gateaux. Mon impression a ete que j'arrivait chez des amis mon mari ete sous le charme des lieux, moi je me detendais (oui je suis plus anxieuse)Endroit parfait pour changer de monde et se détendre Bref pour dire la chaleur humaine est présente le souci de bien faire et une attention particuliére pour chaque personne Le petit dejeuner une merveille Le conseil à tous"
gvlim, le 11 f�vrier 2010 "Gvlim"
staus de même niveau dans la Médina ou à Gelliz." Aur�lie94, le 19 janvier 2010 "Un riad magnifique"
décidée. J'avoue ne pas avoir de critiques à faire tant mon séjour m'a comblée et a répondu à mes attentes. L'accueil des propriétaires, le professionalisme du personnel, le talent du chef Said, le charme et la propreté des chambres et du riad dans son ensemble, la terrasse au calme et au soleil. Et autre point d'importance, la proximité de la place principale de Marrakech (1 minute à pieds)!Bref, que du bonheur! Je recommande cette adresse sans hésitation! Bon séjour dans la médina." barth31, le 07 d�cembre 2009 "un sejour de reve "
nous a pas permis de nous arréter a la qualitédes decorations que nous avons mis 8 jours a apprécier au jour le jour/ le service cuisine ét&it lui aussi a la hauteur du cadre et la gentillesse des serveurs permanente .enfin le couple de gérants nous a permis de profiter au macximun des lieuxhamam, massage etc, on y retourne des que possible ." rgarcia78, le 27 novembre 2009 "Un séjour de rêve !!!" cette petite note afin de saluer un établissement exceptionnel. Dès notre arrivé à l'aéroport, un taxi affrété par le riad nous attendais à la sortie. Un quart d'heure plus tard, et quelques ruelles de la medina franchies, nous arrivons au riad où Marie-Annick (la patronne) nous accueille très gentiment en personne avec un petit thé à la menthe ainsi que des pâtisseries traditionnelles. L'accueil : chaleureux avec un personnel attentionné et discret. Christian et Marie-Annick sont également toujours dispo pour donner quelques conseils de visites et balades. Le cadre : une ambiance cozy et une décoration traditionnelle du meilleur gout réalisée par les patrons Christian et Marie-Annick. 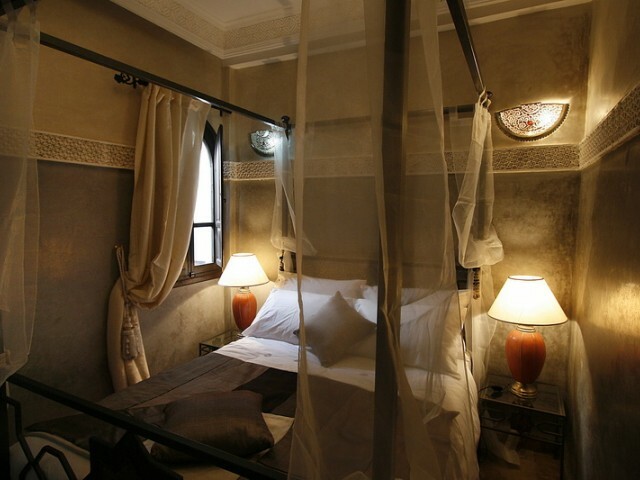 Les chambres : étant à deux couples, nous avions réservé deux suites dans le riad (qui ne compte que dix chambres), celles ci avaient chacune leur ambiance, étaient bien décorées et sont dans un état irréprochable. Les services à dispo : - le restaurant (à réserver à l'avance) est très bon, la cuisine est recherchée et de qualité. Les petits déjeuner sont également extra et permettent de démarrer la journée en plaine forme. Le fait de pouvoir les prendre sur la terrasse (sur le toit) ne gâte rien ;-) - la piscine intérieur présente dans l'entrée du riad est très jolie même si pas très grande. Elle suffit cependant pour faire quelques brasses et se délasser. - le salon de massage : ce fut extra. Pour quelques dirhams, nous avons chacun pu profiter d'une séance de massage relaxant d'une heure, fort appréciable après une journée de ballade dans la medina. - La salle de sport : elle existe, pas très grande mais nous n'étions pas là pour ça ;-) - Le hammam : traditionnel, très propre et....gratuit. Le prix : un rapport qualité/prix à mon sens exceptionnel. Des prestations haut de gamme sans mauvaise surprise pour un budget tout à fait convenable. 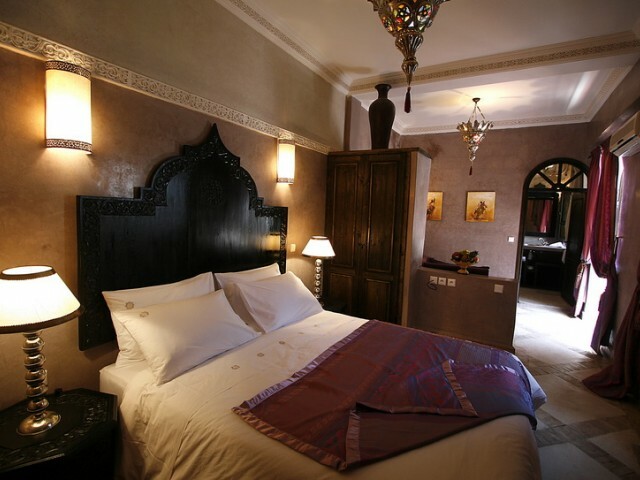 Pour conclure, nous avons passé un séjour inoubliable dans un cadre splendide et une ambiance reposante à deux pas du centre de Marrakech. Nous garderons tous les quatre un souvenir très agréable de ce riad et de son personnel. Pour avoir pas mal voyagé et connu diverses expériences, je conseille vivement cet établissement.Bon voyage !! !Richard"
Groupe d, le 12 octobre 2009 "Un séjour de rêve à Marrakech"
"Nous avons été très bien reçus et installés au Riad al Rimal. 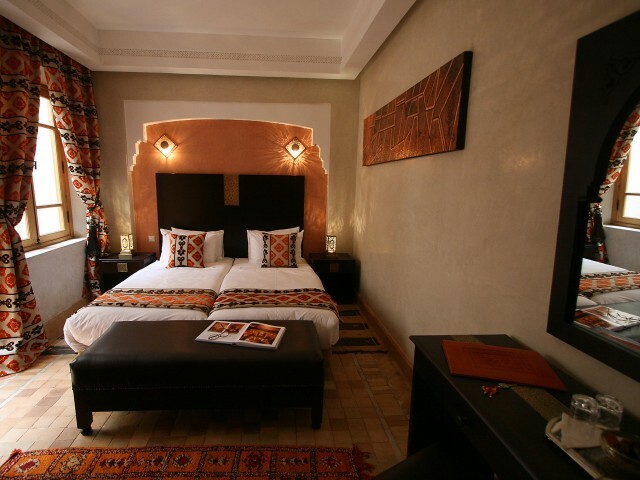 Un Riad d'extrême bon goût et très bien placé, à quelques minutes à pied de la place Djemaa el Fna. Nous le recommandons vivement! titoune, le 30 septembre 2009 "Un rêve s"
"Accueuilli par la propriétaire , le charme a opéré de suite , le cadre est idylique ,service impec. repas divin , le seul regrêt: c'était pour une nuit , nous espérons y retourner très vite ! très pratique , place djema à 2 mn , calme . le loup et le colibri, le 29 septembre 2009 "magnifique séjour "
er nos un an de mariage....AV et LV"
la proximité du riad de la place jama el fna, des souks et des momuments. 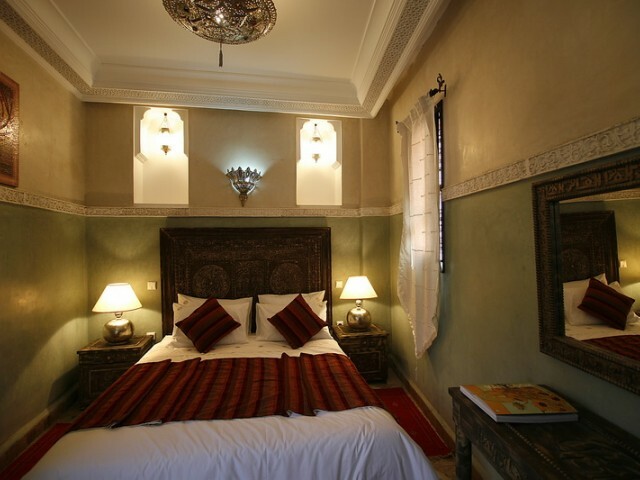 L'accueil au riad. galbussera rosario italy, le 26 ao�t 2009 "wonderful and romantic location and friendly persons"
Princesse, le 23 juin 2009 "MERVEILLEUX"
Olivier, le 02 mai 2009 "Superbe Riad et personnel exceptionnel"
ser tranquillement. La patronne est super gentille, très accueillante, elle discute facilement avec ses clients. Le personnel est exceptionnel, toujours à disposition 24 heures sur 24. Nous recommandons fortement ce lieu à toutes les personnes qui souhaitent garder un souvenir inoubliable de leur séjour à Marrakech. Et encore merci pour ce formidable séjour et espérons à très bientôt." valmi, le 26 avril 2009 "inoubliable"
se, tout le monde s' y retrouvera que ce soit en famille ou entre amis!" le palais des mille et une nuits! Pasclaire, le 21 avril 2009 "Nouvel an à Marrakech"
éveillon au riadh et c'était vraiment sans regrets. La cuisine était excellente et l'ambiance familiale.Une très bonne adresse !" beatrice, le 16 f�vrier 2009 "enchantés!" excursion réservée par nos hôtes. J'ai testé le massage... vigoureux et relaxant à domicile! Nous n'avons pas eu le temps de nous baigner dans la piscine, ni de profiter du hammam. Mais nous avons fêté une saint Valentin, très originale et agréable! La cuisine est vraiment délicieuse, inventive. Ah oui : j'allais oublier: le petit déjeuner au soleil sur la terrasse... inoubliable! Très envie d'y retourner!" accueil chaleureux et personnalisé, personnel efficace, stylé et discret, déco raffinée, cuisine dé-li-cieuse! julia, le 05 f�vrier 2009 "un "
ntillesse et discrétion du prsonnel. Merci beaucoup ne changez rien." Le riad est très bien placé, à deux minutes de la place Jemaa-el-Fna, et près de la plupart des monuments. 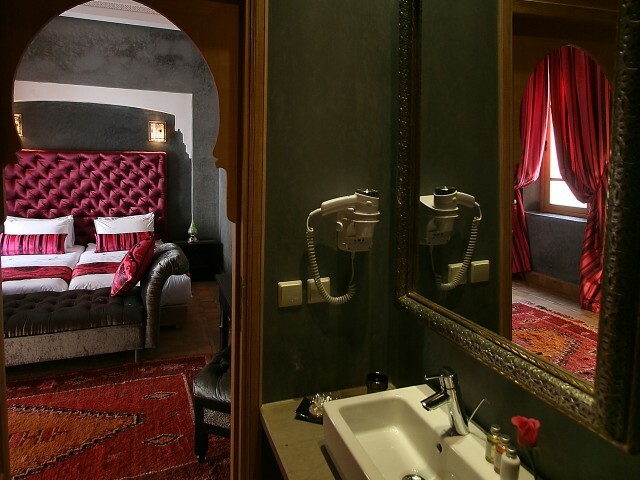 Notre chambre était magnifique et tout est fait pour créer une atmosphère romantique. L'accueil est parfait, le petit déjeuner gargantuesque et varié...Bref un weekend incroyable. Par temps de pluie, c'est bruyant à cause de la bâche mais comment faire autrement? 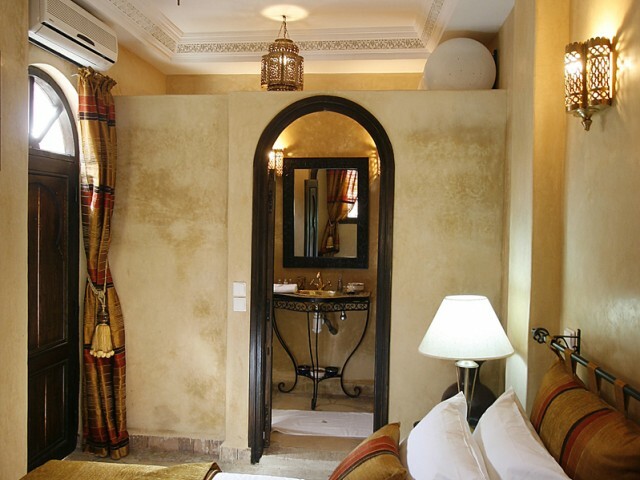 jennifer, le 28 janvier 2009 "un riad à la fois chaleureux et luxueux"
se des lieux accueillante et prête à tout pour que notre séjout soit idéal. De plus, la nourriture est délicieuse du petit déjeuner au diner (surtout les petits déjeuners sur la terrasse!!!). Bref, on s'y sent rapidement comme chez soi...en mieux!!!" Nicole et andre, le 06 janvier 2009 "A CONSEILLER"
x un enchantement, objets, meubleset tapis du pays, sans oublié les tableaux remarquables. Merci pour les couleurs.L'arrivée dans la suite était à l'identique, salle de bains rustique et raffinée.je ne saurais oublier le professionnalisme du personnel, discret, présents et un grand coup de chapeau ou de toque au chef cuisinier Said pour la subtilité de ses saveurs et sa créativité.Merci enfin à Marie-Annick et Christian pour leur savoir faire, leur gentillesse et leur bonne humeur." l'accès au riad ...qui est très vite devenue un plaisir de parcourir ce labyrinthe de ruelles avec son gardien agréable. Les Parisiens, le 04 janvier 2009 "L"
Riad Al Rimal..Nous franchissons donc le pas pour découvrir un lieu magique dirigée par les époux LEBOUR,que dire de la décoration par Madame si ce n'est raffinement et talents.Le lieu est,et ce aprés plusieurs séjours à Marrakech,est le plus beau avec un trés bon rapport qualité prix,d'ailleurs la clientèle est à l'image de ses hôtes :Raffinées et discrétes,une clientèle d'épicuriens qui ont fait le bon choix et qui sur place savoure l'instant présent avec délectation!A quelques pas de la célèbre Place Jemaa el Efna et de la Koutoubia.Un lieu que nous vous recommandons!! !Bon séjour chez Les LEBOUR!!!!" Acceuil personnalisé chaque jour avec un personnel aux petits soins pour vous,reposant et pas bruyant,une équipe extraordinaire dirigée par un couple de grands pros avec un bel esprit de famille.Nous sommes venus en famille avec deux enfants et eux aussi ont adorés l'endroit.Le chef cuisinier Said dont la cuisine est digne des plus belles tables parisiennes,la masseuse Bouchra une fée aux doigts magiques,Rien à redire c'était parfait,faites commes nous vous ne serez pas déçus! dafaelma, le 03 janvier 2009 "Magnifique semaine de Noël "
yeux fermés!Faut trouver un défaut? Bon, disons-le.... le sapin de Noël avec des guirlandes lumineuses un peu kitsch n'était, disons, pas vraiment nécessaire...Un bonjour particulier à Fouad qui s'est beaucoup occupé de nous et à Saïd qui nous a dispensé d'intéressants cours de cuisine marocaine (même qu'on a trouvé un peu cher de devoir repayer le repas que l'on avait préparé lors du cours)"
Briac, le 08 d�cembre 2008 "SPLENDIDE"
lak de chaque pièce ; l?aménagement de l?espace avec plusieurs petits salons disséminés dans le riad permet à chacun de s?isoler ou de se retrouver en famille ; il est également surprenant par son calme pourtant à deux pas de la place Jammaa El fna.Félicitations à Marie-Annick et à son équipe toujours disponibles, et mention très bien pour le cuisinier et particulièrement pour son couscous raffiné aux oignons caramélisés." G4 Sisters, le 18 novembre 2008 "Chouette riad à recommander à tous"
- Fathi - Fouad - Hicham - Bouchra et les autres)étaient d'une gentillesse hors du commun.Merci de nous avoir permis de passer d'agréables moments en votre compagnie (le soleil était également de la partie). Un chouette riad, bien situé, à recommander à tous.Sandra, Jenny, Jessie et Khadija "
SWEETKANJI, le 04 octobre 2008 "Endroit de charme au coeur de la Medina"
Cecile et Nicolas, le 02 octobre 2008 "Un sans faute !" te;moire le coucous au poulet et légumes avec les oignons caramélisés,...ou encore les nems au chocolat,...). Très bon rapport qualité/ prix...NOus avons prévu d'y retourner. Ce lieu est à recommander sans hésitation." dandu56, le 30 septembre 2008 "A RECOMMANDER VIVEMENT SANS RETENUE"
personnalisée pour chaque suite ou chambre.Succession de petits salons et alcoves ou l'on peut se retrouver comme à la maison.Vaste terrasse avec vue imprenable sur la KUTUBIA , nombreux bains de soleil et coussins pour lézarder au soleil.Piscine très originale pour se rafraichir.Excellente table à prix raisonnable le soir .Que du bonheur"
Flenfant, le 30 septembre 2008 "Séjour au RIAD Al Rimal"
Lourigaou, le 17 septembre 2008 "Un dépaysement total du meilleur goût"
étaires sont disponibles pour échanger des idées ou vous conseiller.Petit bémol, par rapport à la vie extérieure au Riad, les boissons et repas sont à un tarif un peu élevé, on hésite à consommer sur place." 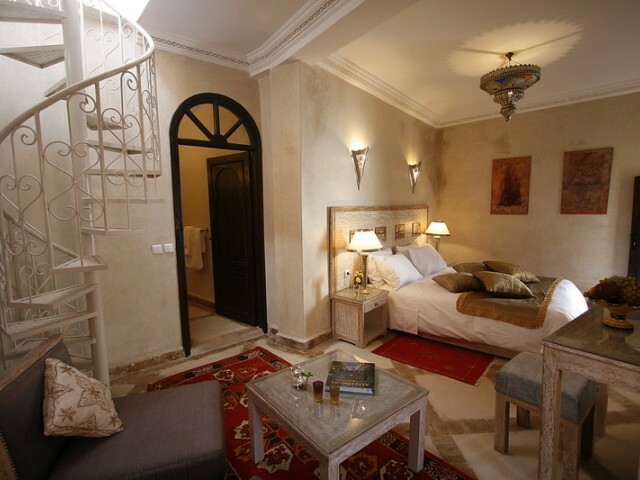 Très beau riad magnifiquement décoré et superbement situé. Les tarifs un peu chers en ce qui concerne les boissons et repas, pour y accéder pas de fléchage ni d'affichage. BULLE, le 07 septembre 2008 "UN BIEN AGREABLE PREMIER SEJOUR!!!" "POUR UN PREMIER SEJOUR C'ETAIT L'ENCHANTEMENT!! 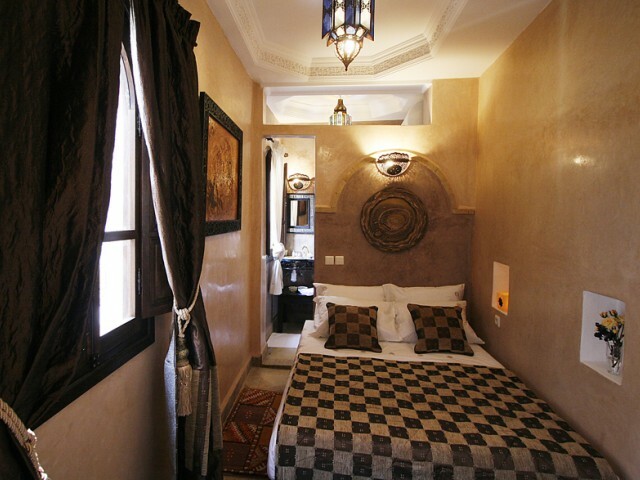 !LE RIAD EST MAGNIFIQUE AVEC UNE DECO TRES SOIGNEE ET DELICATE.LESPETITS DEJEUNERS ET REPAS PRIS SUR LA TERRASSE INOUBLIABLES!! !IL FAUT Y ALLER ET Y RETOURNER POUR GOUTER A LA MAGIE DES LIEUX !! SITUATION IDEALE. 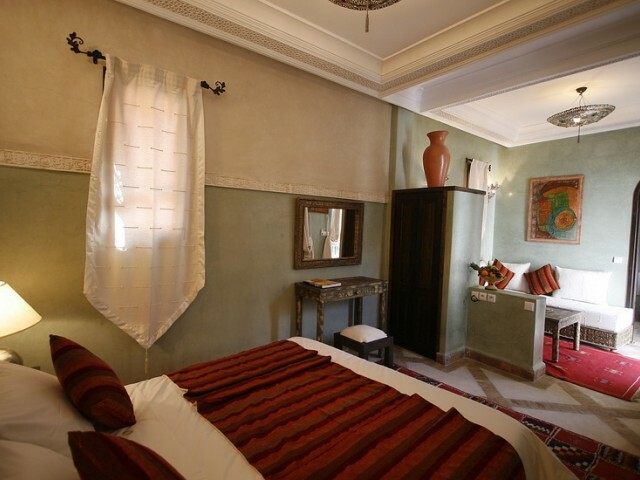 CONFORT MAXIMAL (LITERIE ET LINGE DE LIT EXEPTIONNELS).BEAUTE DU RIAD. Jenni et Arno, le 25 ao�t 2008 "Endroit magique!" s, qui change tout, au retour d'une journée de visite sous un soleil de plomb, on peut s'y rafraichir c'est top!La situation est optimale, à deux pas de la place Djemma El Fna tout en étant au calme. Incroyable!! !Riad recommandé sur tous les plans!!!" myriamrob, le 08 juillet 2008 "non seulement parfait, mais aussi merveilleux !" c;rement le Lieu où il faut aller. Très bon rapport qualité/prix. On se sent bien dès que l'on passe la porte, comme dans un cocon. Les chambres sont hyper belles et la décoration est bien pensée, tout est en harmonie. Foncez, réservez en fermant les yeux, vous ne pourrez que passer un agréable séjour. " 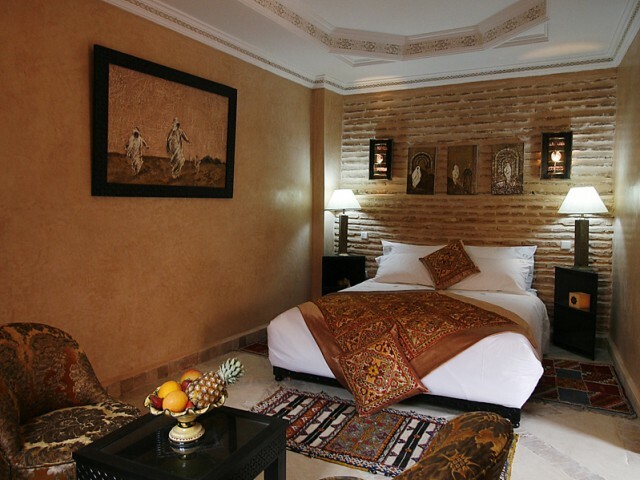 Cécile, le 16 juin 2008 "(Re) découvrir Marrakech grâce au Riad Al Rimal"
grave; l'écoute pour notre confort, et l'équipe à nos petits soins!je conseillerai les chambres du rez de chaussée car elles permettent de profiter du patio et de la fraîcheur du soir près du bassin, mes préférées: la suite blanche (avec terrasse privée et salle de bain à tomber! ), la chambre perle tadelakt gris, qui peut accueillir une famille, et la suite rubis pour profiter d'un patio privatisé ou presque. allez y vous y passerez un séjour fabuleux! " 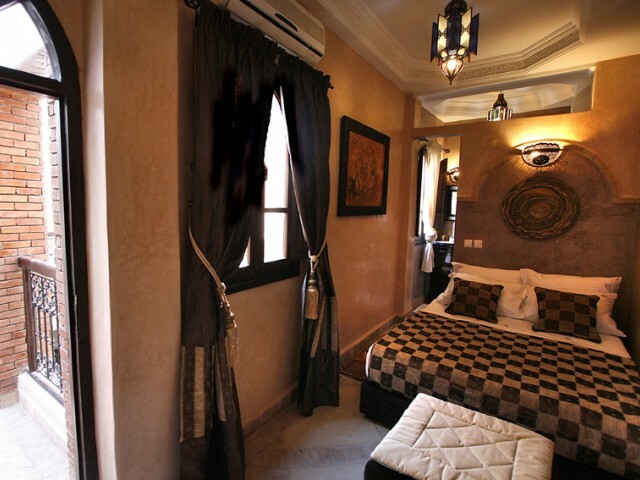 La proximité du riad avec la place Jamaa el Fna, la magie des lieux qui mêlent quiétude, douceur, confort. On retrouve ce qui fait la renommée du Maroc (et qui se perd surtout dans les souks): la chaleur de l'accueil, le sens de l'hospitalité. Toute l'équipe est aux petits soins, sourire aux lèvres, le petit déjeuner copieux face à la Koutoubia est un délice. Les chambres ont toutes leur style, une déco personnalisée, et quel plaisir la baignoire en tadelakt! S'il faut en donner un... la capacité du cumulus un poil limite!! Anne-Flore, le 23 mai 2008 "Vivement la prochaine fois!" "Juste un détail pour résumer le tout : la corbeille de superbes roses qui m'attendait dans ma chambre, le soir de mon anniversaire. Une attention délicate, à l'image du reste du séjour. Décors superbes, emplacement idéal, accueil plus que chaleureux, hammam-gommage-massage et j'en passe à domicile, petit déjeuner délicieux au soleil, toit-terrasse difficile à abandonner pour les visites de rigueur, etc. angela, le 15 mai 2008 "un petit bijou"
e semaine, nous avons pu voir les autres chambres, toutes aussi belles (à noter une avec une petite terrasse privative,du luxe! )Le riad possède des petits salons, disséminés dans l'ensemble du lieu. 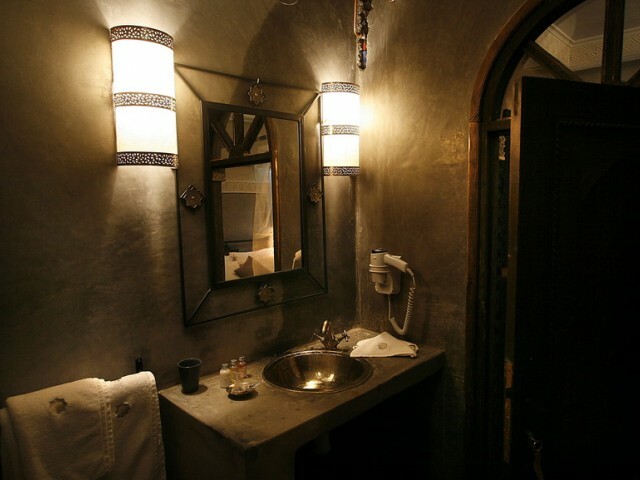 cela permet de s'isoler sans être dans sa chambre mais aussi de retrouver d'autres habitants du riad dans les plus centraux.Le riad offre également une restauration de qualité, et de nombreuses prestations qui rendent le séjour ultra agréable : hammam, tous les soins du corps (qualité/prix imbattable), organise des excursions si vous le souhaitez (Essaouira en 4X4 avec votre chauffeur).Tout le monde s'y sent bien : nous avons croisé des familles, des couples "amoureux", des night-clubbeuses hyper sympas, des gens plus âgés et nous, 3 amis qui avons beaucoup apprécié ce séjour, cette ville enivrante et l'accueil qu'elle nous a réservé.Merci à Marie-Annnick, Christia, Saïd, Fath et les autres...."
Le riad Al Rimal est très bien situé, à quelques minutes de la place Jemaa el fna, ce qui représente un sacré avantage car il est complexe de s'orienter dans la médina et souvent les trajets prévus peuvent doubler voire tripler en temps. Il est par ailleurs récent, très bien décoré, Marie Annick a du goût! A oui, les propriétaires, justes supers, accueillants, attentifs aux besoins et aux souhaits des clients. Le personnel est parfait, qu'il s'agisse des gommeuses-masseuses qui vous attendent dans le hammam, de Fath qui vous ouvre la porte à toute heure de la nuit avec son plus grand sourire ou Saïd, l'une des perles du riad. Je cherche... non vraiment, il n'y a rien à dire pour cette rubrique. Michel, le 14 mai 2008 "Le bonheur, tout simplement"
euners, en passant par la gentillesse de Marie-Annick et Christian qui se mettent en quatre pour que votre séjour se passe idéalement. Et si vous n'êtes pas encore convaincus, attendez de faire la connaissance de Saïd et Fathe !" Marc, le 14 mai 2008 "super"
JC, le 04 mai 2008 "que demander de plus ?" "Emplacement idéal pour ce riad flambant neuf. Propriétaires très présents et sympathiques. Personnel efficace et tout simplement adorable. Petit déjeuner copieux et varié. Pas grand chose à redire si ce n'est un séjour trop court ! 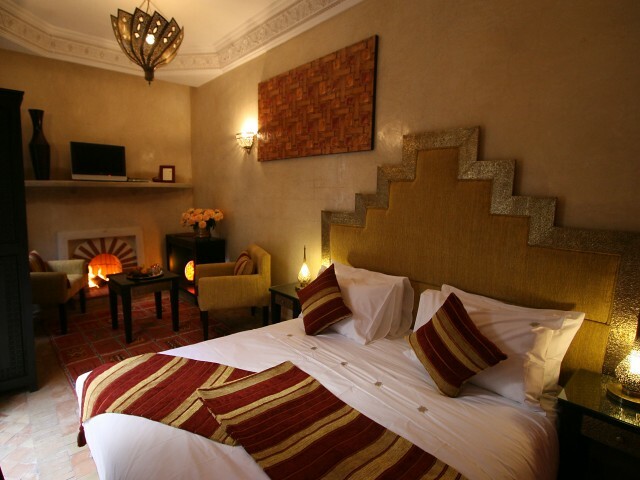 Ana Belen, le 01 mai 2008 "Riad Al Rimal el encanto de Marrakech"
"Nos ha sorprendido a las cuatro personas que estubimos alli, todos hemos viajado y el servicio que ofrece el Riad Al Rimal nunca lo tubimos en ningun lugar, la verdad es que nos hemos venido con ganas de volver pronto. Gracias por todo y esperamos que no cambie. Es un lugar precioso, el servicio insuperable, es como estar en casa. farahone, le 17 avril 2008 "Riad Al Rimal"
urte durée de séjour. Mon amie et moi remercions tout le personnel pour son amabilité et son sens hospitalier qui nous a particulièrement marquées et invitons les personnes désirant trouver un riad avec un bon rapport qualité/prix et une excellente situation à choisir le Riad Al Rimal sans hésitation.Mlle Farah." Très bon accueil, on voit que l'on a affaire à des professionnels, les propriétaires sont d'une grande gentillesses, hospitaliers, très chaleureux, le personnel est aux petits soins durant tout le séjour,le riad est neuf : il est magnifique, très confortable, bien décoré, propre et bien entretenu. Le petit-déjeuner est complet. Les nuits sont calmes et paisibles. Très bonne situation à 2 pas de la place jemaa el fnaa donc point de départ idéal pour aller en excursion.